Papell with Love: Pretty Pink Posh - March 2015 Release Blog Hop! Pretty Pink Posh - March 2015 Release Blog Hop! Welcome to the Pretty Pink Posh March 2015 Release Blog Hop! You should have arrived from Leigh's blog. For my first project I used the square die from the Stitched Banner Duo dies making the negative be the focal point and created a window for the Ellies from Wplus9 Unforgettable stamp set. I first die-cut the square window, then drew my square pencil lines on a separate panel using the window panel as a guide. Once the square lines were drawn I then stamped Ellies to get their positions on the window. Next, I started watercoloring the background on these window images then followed by watercoloring the Ellies. For the image below, you can still see the pencil marks. I erased the pencil marks after the images became completely dry. 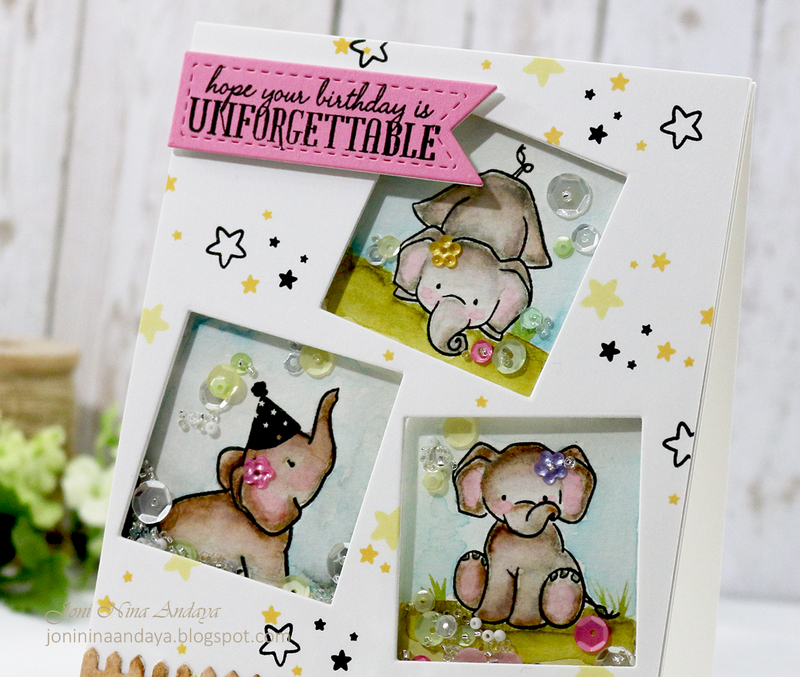 Next, I stamped the window panel using the stars from the same stamped set Wplus9 Unforgettable stamp set the sentiment "hope your birthday is Unforgettable" is also from the same set. The sentiment was stamped using the new Pretty Pink Posh Stitched Labels 1 dies. I used the banner label die. Next, I added all the sequins and seed beads from Pretty Pink Posh to create a shaker window for my card. The sequins I used Spring Flower Sequins Mix, 4mm Springtime Sequins Mix, 6mm Springtime Sequins, Lime Sorbet, Sparkling Clear, Summer Mix Sequins. I also used the seed beads in Silver Shimmer, Marshmallow, and Sparkling Clear. On this card I also used the new Pretty Pink Posh Picket Fence Die, and Lawn Fawn grass die. For my next card I used the new Pretty Pink Posh Stitched Banner Duo dies. I used just the banner this time to created an image tag for my card. Really simply to assemble card, I think it took me longer to color and fussy cut all the images. 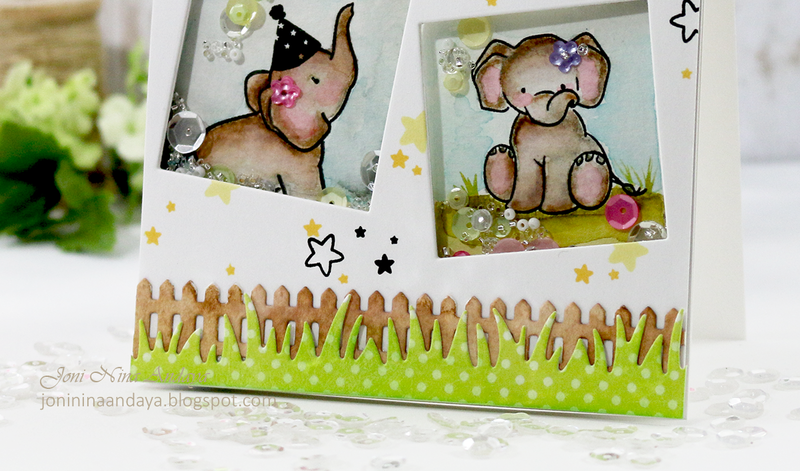 The monkey and the elephant are from the new Lawn Fawn Critters in the Jungle stamp set. Next, to create a more fun look I cut a slit on the Ellie's trunk to insert one of the new Pretty Pink Posh Stitched Labels 1 dies as if the Ellie is holding the label tag. To finish it off I added some PPP Sparkling Clear and Summer Mix Sequins. You next hop is to Gayatri's blog. There are 2 $25 gift certificates up for grabs. Winners will be picked randomly along the blog hop. (Comments must be left by 11:59 PM PDT on 3/11/2015. Winners will be announced on the PPP blog). Ohhhhhhhhhhh that elephant just makes me so happy!! I love love love these!!!!!!!!!!!!!! soooo cute! love the elephants!! Those are adorable! I love the way you colored the animals. Oh my God your work is always some of the best I've seen!!!! I LOVE both of these!!! Oh my! Such DARLING cards! Love how you colored the elephants! Oh my goodness your cards are awesome! Love the water colouring! What a clever way to use the new dies from Pretty Pink Posh! You gave us some wonderful ideas. I love the combination of the animals and the colorful sequins. LOVE LOVE both the cards! Just added a whole bunch of stuff to my wish list! These are awesome. Clearly you're a master watercolorist. Both of your cards really made me smile! They are so adorable!!! Wow! These are amazing!!!! LOVE the cards! So adorable! Can't wait for these dies, love the banner die!! Your cards are SUPER fun and Adorable! Great coloring on both cards! Your cards are both wonderful! I love your creative designs on both cards! Oh, I love both of these, Joni! 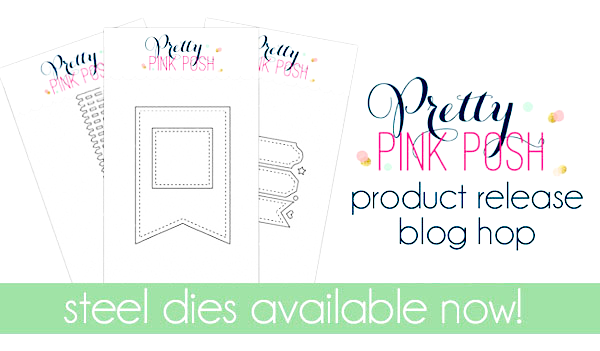 Fabulous cards with the new PPP dies! Oh my such sweet cards. Super cute coloring of the images and the PPP dies make the layouts so fun! Love your first card! That elephant is too cute and who says that the fence has to be white! I get something stuck in my head that that is the way it is supposed to be and I can't see it any other way. Thanks so much for sharing your creations! Absolutely adorable. They are full of fun!! These little elephants are the cutest EVER! So adorable, and you did such a beautiful job with the color! These caeds are so happy and sweet! Great work! 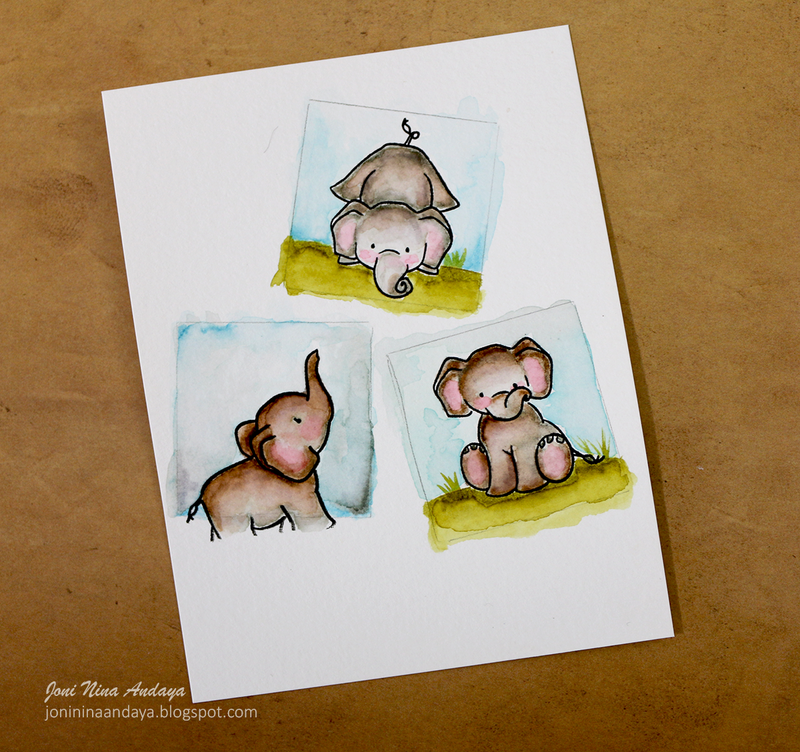 Sweet little elephants for a sweet little card! Love these cards, Joni! What a great use for the square die! Love the three windows. Very clever! Adorable cards! Love these dies! Both your card designs are absolutely gorgeous, love the images with the watercoloring!!! your watercolors have me mesmerized! I want to study them until my eyeballs learn! Wow your cards are so beautiful, but my favourite one must be the first one! These elephants are so beautifully coloured in! I love the windows card idea so cute! Oh, I just HAVE to get those elephants, just precious! So creative! Love your ideas and the use of the dies and sequins is perfect. Thanks! Your cards are 'unforgettable', they are just fantastic! AUHMAZING...cards Joni! Both of them are Fabulous! Your cards are so amazing!!!!! I love the way you watercolored those precious elephants!!! I absolutely love these cards! The elephant shaker card is so cute! These cards are so adorable!!! I absolutely LOVE the elephant one!! Beautiful mini-scenes you created!! Exceptional cards for the new release Joni, love that trio of ellies! This is just amazing. So clever and creative. I'm already obsessed with owning the Unforgettable set and now you have taken it to new heights. How clever to use the dies that way too. Such great dies from PPP. Like both of your cards - nice use of the square die from the new banner die - thinking out of the box. Wow! Your water coloring on the first card is amazing! OMG Your cards are amazing and so cute!! Girl you totally outdid yourself with your shaker card OMG I'm awestruck over what you did...OMG this sure is one super adorable....fabulous and oh so fun card....you definitely did one super outstanding job!! WOW!! Now your Thanks A Bunch card is too cute for words...OMG you definitely come up with such clever, cute and creative ideas. Your colors is positively awesome. You sure are one super talented gal. YOU so ROCK!! Such fabulous card made! Really love those Unforgettable Set from WPlus9!!! Beautiful colors on the elephant! JOni, Joni, Joni!!! Just so CUTE!! and WHY didn't I get these ellies - oh! sold out!! Thanks for another fab idea for a cut window! both cards are so beautiful, but my goodness, the first is stunning! Oh what awesome cards!! So cute! Love me some Pretty Pink Posh !!! OMG!! Your first card makes my heart SING!!! I am awaiting the Unforgettable stamp and die set as we speak!! Can't wait to get them! I had an idea in my head similar to this and seeing your card I KNOW I will be recreating it!! ADORABLE!! The monkey card is pretty sweet also! TFS! 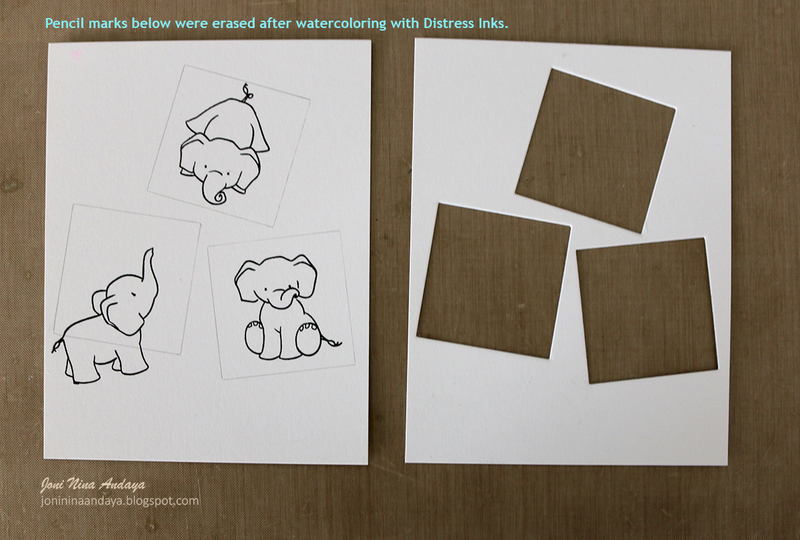 Seriously, Joni, your watercolored elephants look like they came straight from an illustrated children's book. Have you ever considered doing something like that? I'd totally buy it!! Both fabulous cards! I love that you made the picket fence brown! These are great dies. I love the coloring on both of your super cute cards! So much sweetness on one card Joni! WOW! little mini-masterpieces! beautiful use of the dies too! Two very cute cards...love the sweet images and great dies. These are just fantastic and especially love the way you used the square die. Your colouring of the elephants is brilliant!! Super cards !! I really love the first one with the cute elephant in the windows . So stinkin' adorable Joni! Love the peeks of each elephant through their die cut windows. 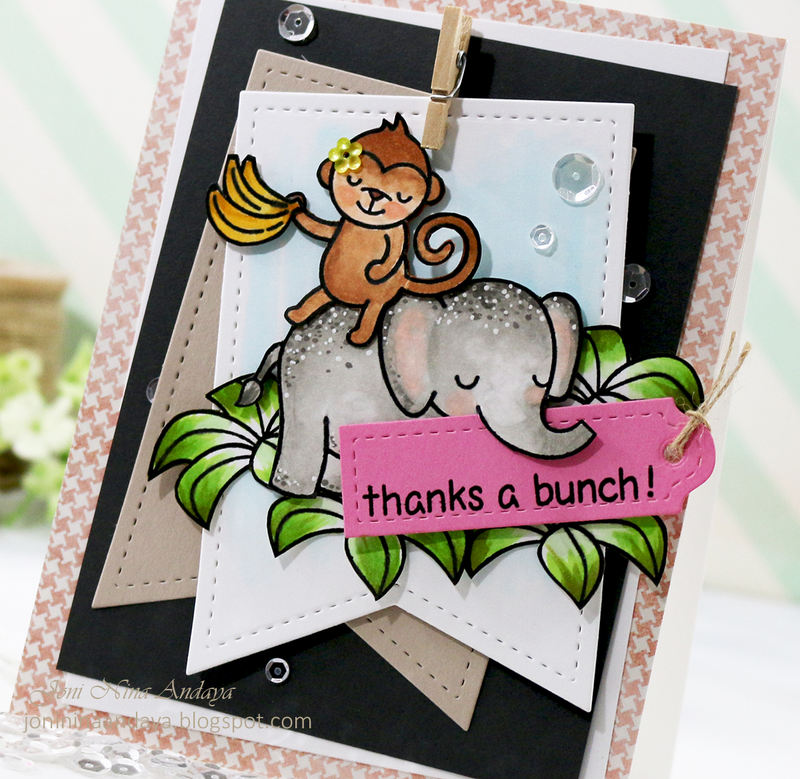 And your monkey and elephant combo card - adorable!!! wonderful cards and love all of the new release, I’m off to hop!! TFS. Those elephants are too cute! Great dies from PPP and oh.my.goodness. The cutest elephants I have ever seen -- the best coloring too. I just love how they are done with the distress inks. And the elephant and monkey card is adorable. Love the way your mind works. These 2 cards are so adorable!!!! Oh my gosh... triple shaker. So awesome! And that monkey is adorable. Wow! These are so amazing, your attention to detail is incredible! Just awesome!!! Oooohhhhh.....what a fabulous shaker card!! I love the triple image/box layout. So creative. Awesome layering of the die cuts on your adorable second card. I am so excited! I just got the Unforgettable set and I love what you have done! I will be taking some serious inspiration from your creation! WOW!! Love your Ellie window card!! Also love your Thanks a Bunch stitched banner card!!! I so love those little elephants. Great card! UNFORGETTABLE BUNCH OF CRAFTY AWESOMENESS Joni!!! Very cute cards! I love Paulina's new dies. Thanks for sharing your great ideas! This is such a great card Joni! I LOVE the little picture squares!!!!! I have a collection of elephants so you know I'm over-the-moon with the cards. Wow - your coloring is absolutely AMAZING!!! Love the tutorial for your layout, too! Thanks so much for the wonderful inspiration! Oh my!! I think these are two of the most lovely cards I have seen in a LONG time. I LOVE your fun elephant card. The watercoloring you did is just stunning. The second card is absolutely, positively adorable. I did not want that stamp set but now I do!! Wow, how fun and cute is your shaker card! So pretty - love those little elephants. WOW!! You cards are works of art! Both of your cards are so cute! Lovely job with the watercoloring. I love how you used all three and water coloring was awesome! Adorable cards and fab water colouring! Oh dear! Both cards are so cute! Thank you for sharing! Darling cards Joni. Love the sweet elephants and the wonderful coloring! The rectangle window openings look great on the first one... great layered banner on the second. These are just so adorable! Also, thank-you for showing us how you did the triple square with those cute elephant...it's gorgeous along with the elephant and monkey. Two amazing cards! Love your awesome coloring on them both! These are just fabulous! That trio of images card....brilliant! These are both the cutest , sweetest and perfect cards !!!! Very cute cards,well executed!! Love the trio of windows! Seriously adorable cards, Joni! Love the playful fun designs of both to pieces! All the elephants make me smile and I adore the monkey, too, and brilliant use of all the new dies and the beautiful sequins! Love!